While Indiana University freshmen were struggling to find their way around the maze called Ballantine Hall, one unlucky student found himself in the stickiest of situations. Lukas Cavar, a Bloomington native and IU freshman, was stuck in a cave for nearly three days without food or water. Cavar ventured to Sullivan Cave with IU's Caving Club on Sunday morning, according to the IDS. The beginners trip brought 12 students and two leaders to the Southern Indiana cave, and despite using the buddy system AND conducting a head count before and after everyone exited the cave, Cavar was left behind. “We have a series of rigorous protocols in place that are supposed to prevent situations like this, but they are only effective if followed,” a statement from the Caving Club's president read. “We had a failure in our leadership to closely follow all these safety procedures. The risk that our member was exposed to as a result of these failures is a vivid reminder of why we have protocols." For six to eight hours the young freshman yelled for help, hoping anyone would hear him. He had an iPhone, but no cell reception. He had Cliff Bar wrappers and water bottles, but no food or liquid. Cavar resorted to licking the walls of the cave for hydration. It tasted like a "hint of salt and a grainy texture," he said. After spending nearly three days trapped in isolation, an EMT certified Caving Club leader came to Cavar's rescue at midnight on Tuesday. The freshman wasn't taken to the hospital because he seemed healthy and mentally stable. "I'm just really busy getting everything back on track, you know? Missing three days of my life is no joke," Cavar said. 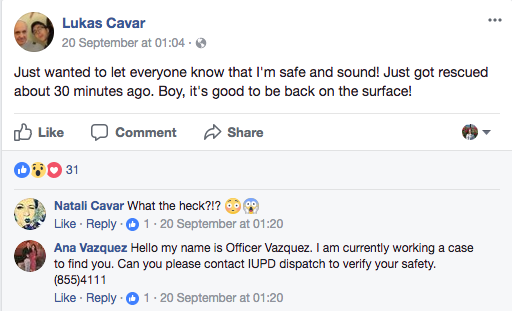 After arriving safely back at his dorm, Cavar posted a status on Facebook to assure everyone he was alive and well. Boy, we're glad you're back too. And a word of advice: stay away from caves for a while.